Lovely place to stay - ideal for families although we couldn't get a ground floor room as there were not that many available. I would recommend these studios for those who want a simple greek holiday with clean and quiet apartments. Far exceeded expectations. Accommodation simple but extremely clean. Superb view of the mountains. Lovely pool area and about 10 minutes walk to the beach. Eleni who runs the accommodation is fantastic and - very welcoming, friendly and really goes the extra mile. We stayed at the Roulla (self-catering)apartments in Alykes, it was our second visit there and once again we found it very clean and set in an excellent location with a lovely mountain backdrop view, with the beach only a five minute walk acros the salt flats away.The owner Eleni along with her husband and two daughters make the perfect hosts,we were met with a warm greeting and cheery smile and nothing was too much trouble for them,in fact we were invited to their daughters birthday party by the pool one evening,as were all the guests staying at the Roulla. I celebrated my birthday during our stay, and returned to our room that day to find a bottle of champagne and a beautiful vase of flowers that Eleni has left! We returned home with two bottles of home made (excellent!) wine and many happy memories of the Roulla, we plan on returning yet again next year and would recommend to anyone. 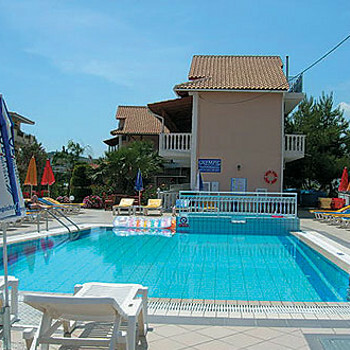 Exceptionally friendly family run apartments - nothing was too much trouble for landlady and family.